You don’t have to waste a fortune in order to look good. Being in shape is just a matter of will; you can hire the finest trainers and go to the best gyms, but if you don’t previously decide to dedicate yourself to your health, all of that will be for nothing. With the right motivation, you can achieve that figure you always wanted in the comfort of your home and without worrying about unrealistic gym bills. Establishing a home workout routine is beneficial for several reasons – this small investment is here to stay and you’ll have every tool at your disposal forever. The whole family can use your little home gym, so that cuts bills significantly for your household, and you will have more time because there will be no home-gym-home traveling every time you want to exercise. With this in mind, you should be feeling inspired to create your little home gym, so check out the following nine fitness tools that will boost your confidence and help you get fit in no time. 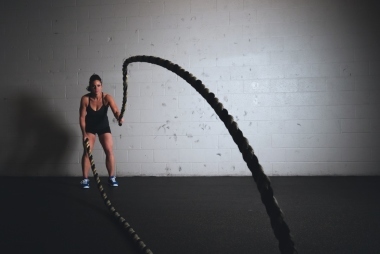 Although people avoid jump ropes because they usually have only two associations when those words are mentioned – little girls in pink dresses or tough boxers – using jump rope in your exercise routine is highly beneficial and it’s relatively easy for beginners to get used to the different exercises. Apart from helping you burn a huge amount of calories (it actually can be more efficient than jogging), jumping rope makes you lighter on your feet. This means that your coordination gets significantly improved because this exercise is all about focusing on your feet. The more jump rope tricks you discover and learn, the more coordinated you’ll get. You should know that when compared to the barbell, dumbbells can be a bit more versatile, giving you a larger choice of exercises, and they are cheaper than a full barbell set and rack combo. They will provide you with plenty of variety in your workouts and they offer a more natural selection of movements, because unlike fixed machines and cables, they can move freely in all different directions. This exercise tool can be used to train both the lower body and the upper body, which makes them a worthy addition to your home gym, and one that’s quite efficient and simple to store at that. The only difficult thing about yoga is starting to practice it – after that I’m sure you’ll fall in love with it just like everyone else. Of course, you should start with a beginner’s program and move up from there gradually. The list of benefits of practicing yoga is quite extensive. Other than the obvious benefit of increasing flexibility, it has a positive impact on your isometric strength and muscle tone, improves your respiration, decreases stress and increases your energy levels. Your post-exercise routine is as important as the actual workout, and it’s quite important for you to take good care of your muscles. My suggestion is to go with a foam roller in order to prevent sore muscles and cramps, especially when it comes to your back. Lifting weights can burden your lower back muscles and if you don’t do something about it, you can be in pain for weeks. Speaking of spine alignment – stability balls are highly beneficial solution for this problem. It’s quite simple really. Because of ball’s instability, you need to work on balance and thus practice and achieve a proper posture. You can use it for stretches and simple workouts, but you should know there’s a ton of different tutorials that show you how to do a full body exercise with it. Did you know that each rollout using an ab wheel actually moves over 20 muscles in your body? This smart tool is unbelievably efficient; if you’re persistent with repetition, you’ll get that six-pack you always wanted quite quickly. You should also know that using an ab wheel isn’t any more difficult than doing crunches – you’ll just need some time to get used to it. The greatest problem I had with running is discipline – the most difficult part of this type of training is getting your mind in the zone and staying motivated, and if you do manage to be persistent in it, you will not only strengthen your body but your mind as well. Obviously, running helps you lose weight, but it also firms up your muscles equally and gradually. With a relatively decent pair of running shoes – which you can often get on sale – you’ll be ready to hit the road any time you feel like it. Having a mini gym is a pretty smart move, but you already know that you can hurt yourself by doing the exercises wrong. I’m sure you’ll go online and consult various tutorials and programs until you find the one that works for you, but you need to make sure your posture and your movements are reflecting those that you see – which is why a big mirror is an essential item in your home gym. Did you know that working out makes you happy? When you exercise, your mind tells your glands to release happiness hormones, because you’re doing a good thing for your figure, your health and your confidence. Exercising really contributes to the overall quality of your life and if you actually go through with your little home gym project, you’ll be a lot happier.